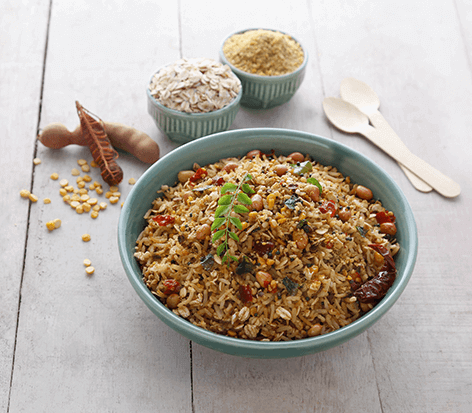 Traditional flavors of tamarind rice with the goodness of whole oats. Dry roast all the spice mix ingredients in a pan for 3-4 mins. Cool and grind. Place Oats in a colander, gently moisten with water and keep aside. Heat oil in a pan, roast dals for a min, add mustard seeds & let them crackle. Toss in dry red chili and curry leaf and saute for a min. Mix tamarind paste with water and add to the tempering, cook till water absorbs. Mix in moistened oats, salt , jaggery and toasted peanuts . Turn off the flame. Add in cooked rice, sprinkle spice mix and toss well. Cover and keep aside for 5-6 mins for the flavors to blend. Serve.